Butler, M., 2018. Seismostratigraphic analysis of Paleozoic sequences of the Midlands Microcraton. Geological Society, London, Special Publications, 471,pp. SP471-6. A regional review of publicly available seismic reflection lines and wells enables the identification across the Midlands Microcraton (MMC) of four Paleozoic seismostratigraphic megasequences, bounded by the Shelveian, Acadian, Symon and Variscan unconformities. The southern boundary of the MMC is drawn at a line of major change in pre-Permian subcrop, and most of central southern England is considered underlain by Paleozoic rocks of MMC character. The Lower Silurian Shelveian Unconformity cuts down through Ordovician and Cambrian rocks to the Precambrian and largely defines the distribution of these rocks in the region. However, more than 2500 m of Tremadoc shales are preserved SW of Swindon. Above the Shelveian, a characteristic shallow-marine Silurian is overlain by up to 3000 m of Old Red Sandstone facies, preserved in a north–south-orientated syncline. The Acadian Unconformity cuts down through folded Lower Paleozoic rocks, with the Frasnian transgression overlying Precambrian in places. Little Carboniferous was deposited across the MMC until uppermost Westphalian–Stephanian Warwickshire Group sandstones and coals were laid down across the erosion surface of the Symon Unconformity. The northern boundary of thin-skinned Variscan thrusting can be interpreted on seismic data but appears to have had little effect on the regional pre-Permian subcrop. folding below the Shelveian Unconformity. Pullan, C.P. and Butler, M., 2018. Paleozoic gas potential in the Weald Basin of southern England. Geological Society, London, Special Publications, 471, pp.SP471-1. Gas has been found in Mesozoic reservoirs in the Weald Basin, particularly along the northern margin. Most of the gas is dry, with a high methane content and often associated nitrogen. Isotopic evidence indicates that the gas is from a thermogenically mature marine source. Although there is evidence of some shallow, biogenic gas, only the lowermost Lias is projected to have reached the thermogenic gas window before Tertiary uplift. Estimated maturities from isotopic data from the main gas accumulations indicate significantly greater levels than those projected for Liassic shales: thus, the gas is thought to have originated from Paleozoic rocks. Data on the distribution of Paleozoic rocks subcropping the Variscan unconformity is limited. However, available data suggest that their distribution owes more to Acadian erosion than to Variscan. It is thought that the Upper Devonian and Lower Carboniferous transgressed over a thick, folded Tremadocian shale sequence in the west, and over folded Silurian and Lower–Middle Devonian rocks in the central Weald. There is some evidence for the presence of isolated late Carboniferous or early Permian clastics but no significant coals have been encountered to date. Regional source studies suggest that the only Paleozoic rocks with potential are post-Acadian-aged Devonian shales. Variscan subcrop map based on seismic mapping, well and coalfield data, and making use of Busby & Smith (2001). Butler, M., 1998. The geological history of the southern Wessex Basin-a review of new information from oil exploration. Geological Society, London, Special Publications, 133(1), pp.67-86. Mapping of intervals between the base of the Aylesbeare Mudstone (Permian or early Triassic) and the top of the Penarth Group (early Jurassic) in the Dorset-Isle of Wight area indicates that the deposition of these formations was influenced strongly by northwest-southeast-trending faults, probably related to underlying Variscan elements. There are significant differences between the distribution of the Aylesbeare Mudstone and that of later Triassic formations. An unconformity is recognized within the Sherwood Sandstone Group, separating the syn-rift sequences of Aylesbeare Mudstone, and overlying Budleigh Salterton Pebble Beds and anhydrites from the post-rift Otter Sandstone and Mercia Mudstone (middle-late Triassic). It is postulated that the top of the Sherwood Sandstone Group becomes progressively younger from the Mid Dorset Platform towards the Isle of Wight, steadily replacing the lower Mercia Mudstone. Halite beds are present within the middle Mercia Mudstone of Dorset, although they are absent over much of the Mid Dorset Platform and areas to the east of Wytch Farm. East-west-trending faults became dominant in the Jurassic, and there is strong seismic evidence for syn-depositional movement on these faults during the Lias across the entire Dorset-Isle of Wight area. In Dorset, Many of these east-west faults are listric, hading out into the Mercia Mudstone halite and creating very different structural styles above and below the salt. Major syn-depositional movement is thought to have also taken place along these faults during Kimmeridgian and Portlandian times, creating a series of rollover anticlines in the hanging walls. Seismic evidence indicates that the early Cretaceous sequences of the Portland-South Wight Trough thinned rapidly onto the footwalls of these east-west faults and that very little deposition took place north of the Purbeck Disturbance, either in Dorset or on the Isle of Wight. Several of these east-west faults reversed their throw during compression associated with the mid-Tertiary inversion. Reverse displacement estimates range from 50 m on the Litton Cheney Fault to 1320 m on the Purbeck Disturbance in the Isle of Wight. Offsets of the inversion trends may be related to underlying northwest-southeast-trending Variscan faults which influenced the margins of the Jurassic and early Cretaceous basins, but strike-slip movements may have accentuated some of these offsets during the Tertiary. These offsets appear to be dextral to the west of Wytch Farm oilfield and sinistral in the area to the east. Structural styles suggest that there may also have been strike-slip movements along east-west-trending faults. Butler, M. and Pullan, C.P., 1990. Tertiary structures and hydrocarbon entrapment in the Weald Basin of southern England. Geological Society, London, Special Publications, 55(1), pp.371-391. 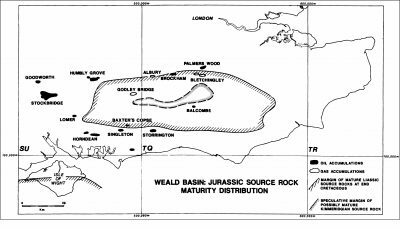 The Weald Basin of southeast England was formed by rapid subsidence associated with thermal relaxation following early Mesozoic extensional block faulting. The basin appears initially to have taken the form of an easterly extension of the Wessex Basin but became the major depocentre during the Upper Jurassic and Lower Cretaceous, with associated active faulting. These movements appear to have ceased prior to Albian times and a full Upper Cretaceous cover is believed to have been deposited in a gentle downwarp which extended far beyond the confines of the Weald and Wessex Basins. Major inversion of the Weald Basin took place in the Tertiary, with both gentle regional uplift, which in the eastern part of the basin is estimated to have exceeded 5000 feet (1525 metres), and intense local uplift along pre-existing zones of weakness, which led to the formation of compressional features such as tight folds and reverse faults. Zones of Tertiary deformation appear to have been strongly influenced by underlying, particularly Hercynian, structural trends. Lower Jurassic source rocks reached maturity in the early Cretaceous and initial migration occurred at this time, often over long distances, into traps closed by pre-Aptian faults. Tertiary tilting and uplift led to the breaching of many of these pre-existing traps and the formation of large folded closures. A second phase of hydrocarbon migration, particularly of gas, took place at this time, with significant vertical migration along fault zones. Major reservoirs located to date occur in Middle Jurassic carbonates and Upper Jurassic sandstones, but deep burial in the basin has caused considerable destruction of primary reservoir characteristics; changes in the temperature and pressure regimes and the mobilization of fluids within the basin resulting from the Tertiary uplift caused further diagenetic changes, particularly in the carbonate reservoirs. Exploration of the Weald Basin remains at a very early stage, with a low drilling density to date. The more recent drilling has focussed on earlier structures, but traps formed or modified during the Tertiary movements represent important exploration objectives, although general deterioration in reservoir quality towards the centre and east of the basin makes large fold closures in these areas less attractive. Postulated areas of mature source rock at end Cretaceous times, showing known hydrocarbon occurrences.